The free-kick is the last chance of the match as referee Martin Atkinson blows the full-time whistle. A draw was a strong possibility before the match and that's the way it turned out in the 100th game between these two sides. Baggies midfielder Claudio Yacob fouls Manuel Lanzini and the Hammers have a free-kick in a dangerous position - 22 yards out in a central position. Aaron Cresswell steps up to take the set piece and his low effort is palmed away by keeper Boaz Myhill. A chance at the other end now. Rickie Lambert plays a lovely ball over the top of West Ham's defence but James McLean can only poke it straight at keeper Adrian as he fails to get enough power on his shot at full stretch. West Brom can't clear their lines and Andy Carroll finds Manuel Lanzini. He does well to deliver a cross to Victor Moses, whose volley goes agonisingly wide for the home side. West Ham are still dominating possession but can they turn it into a goal? A Hammers free-kick is launched into the Baggie box and Andy Carroll gets in a shot which is charged down in a crowded area. About 10 minutes to go and Hammers boss Slaven Bilic brings on Michail Antonio for Mauro Zarate. Diafra Sakho is left on the floor after his effort and he immediately signals to the bench that he is injured. Nikica Jelavic comes on in his place and Sakho could be out for a while judging by the way he has limped back to the dressing room. The Hammers break with Victor Moses and he charges at the Baggies goal. He finds striker Diafra Sakho, who is in a good position but sees his angled shot is brilliantly blocked by the sliding Jonas Olsson. West Ham striker Andy Carroll, with his hair neatly put in a bun, comes on for midfielder Pedro Obiang. Salomon Rondon looks set to put West Brom in front as he rises to meet a Darren Fletcher chipped cross but his header is brilliantly saved at point blank range by keeper Adrian. Top keeping. Rickie Lambert is certainly making his presence felt at the Boleyn Ground after his half-time introduction. The striker wins a free-kick and his resultant free-kick from 30 yards is palmed wide by keeper Adrian. West Brom have scored in this game despite not managing a shot on target themselves yet. West Brom have a bit more about them in the second half so I'm guessing manager Tony Pulis might have had a bit to say at half-time. Hairdryer. What a substituition. Rickie Lambert has only just come on but helped his side equalise. Darren Fletcher makes a powerful run before Lambert's left-foot shot comes off West Ham defender Winston Reid and goes into the Hammers net. It's as you were at the start of the second half as West Ham are on the attack and the Baggies hanging on. West Brom might be losing but Baggies midfielder James McLean appears to be doing his bit for them. He has covered the most distance of any of the players in the first half (6.20 km), made the most sprints (40) and his average speed of 8.02 km/h is also the highest in the match so far. "West Ham are in front thanks to a brilliant free-kick from Mauro Zarate after a first half in which West Brom hardly threatened Hammers keeper Adrian." West Brom survive another scare. A ball is fizzed across their area from the left and finds Diafra Sakho, whose shot is blocked by defender Jonny Evans. West Ham keeper Adrian has hardly had anything to do. He might as well get his tablet or phone out and do a bit of Christmas shopping. West Ham have lost just one of the last 22 Premier League games that they have scored first in (W15 D6 L1) before today. The defeat came in a 1-2 loss at home to Everton in May. Along with having the lion's share of possession, West Ham have also had five shots - of which three have been on target - compared to West Brom's one. Another West Ham chance. Goalscorer Mauro Zarate produces a nice run on the right of the Baggies box and squares the ball for Manuel Lanzini, whose first-time shot is palmed away by keeper Boaz Myhill. Mauro Zarate's goal for the Hammers was the eighth direct free-kick scored in the Premier League so far this season. West Ham are all over the Baggies. Manuel Lanzini robs Claudio Yacob off the ball, runs at the visitors' defence and unleashes a swerving strike which keeper Boaz Myhill fends away. West Brom are rocking. Cheikhou Kouyate makes a run in between the two Baggies centre-backs to meet Aaron Cresswell's cross but heads his effort wide. Baggies defender Jonas Olsson is booked for dissent in the aftermath of Mauro Zarate's goal. I can only think that he was complaining to referee Martin Atkinson over the foul by Garath McAuley's on Diafra Sakho which led to the goal. What was I saying about West Brom being a tough nut to crack? Well forget it as Mauro Zarate has just breached the Baggies defence with an exquisite free-kick. He sized up the chance from 25-yards before curling his effort over the wall and into the top corner. Lovely. West Brom striker Salomon Rondon lets fly from 22 yards and he gets plenty of power on the strike but sees it go just wide. Mauro Zarate could have missed what could be a rare chance for the Hammers if this season is anything to go by so far. The Baggies have let in just four goals on their travels this season which is the equal lowest along with Premier League leaders Manchester City. A nice move from the Hammers. Diafra Sakho finds Manuel Lanzini and he shows some Strictly Come Dancing type of footwork to evade a couple of defenders before finding Mauro Zarate clear on the left side of the Baggies box. Zarate, though, slices a left-foot shot disappointingly into the side-netting. West Ham striker Diafra Sakho urges his team-mates to move higher up the pitch as West Brom start to take control at a rather sedate Boleyn Ground. The Baggies pass it around nicely before Salomon Rondon whips in a cross from the right which Hammers defender Winston Reid heads clear. Have the Baggies got top 10 potential? West Brom head coach Tony Pulis has compared the Baggies to former club Crystal Palace. "They are clubs who have potential to be top 10 and better Premier League clubs, and ones which can win cup competitions," said Pulis. "That's what you have to strive for but you need time. There's a big job on at this football club. "I haven't been in the job a year yet. There are things which can be changed and improved but that doesn't happen for a period of time." West Ham boss Slaven Bilic wants his side to put right what went wrong in the 4-1 defeat by Tottenham last week. "The players, like the whole staff, were hugely disappointed after the game on Sunday and angry with the way we played [against Tottenham]," he said. "In the last three games we have got only one point and that is not what we want. "We have a home game now and our plan is to try to win. We will do everything we can to bounce back." West Ham have failed to keep a clean sheet in any of their last eight league games, conceding 14 goals. It's the longest current such streak in the division. 65% of the goals West Ham have conceded have come in the first half, the highest proportion in the top division (13 out of 20). The Baggies have won five of their last 10 Premier League away games, losing just three (D2). "On New Year's Day, Tony Pulis was at Upton Park ahead of his appointment as West Bromwich Albion's head coach. "The Baggies were in trouble and had turned to the man who has never been relegated in his managerial career to keep them in the Premier League. "Almost 11 months on, West Brom travel to London on the back of victory over Arsenal, but Slaven Bilic has given West Ham a fresh perspective and they come into this match unbeaten in their last four at home. "Back on 1 January it was a 1-1 draw; don't be surprised if it ends the same way this weekend." There is a league table of how each club's fans are doing. One of today's sides are third, but you'll need to check out the game to find out which one. The other team are bottom half. It's the battle of the West's in the Premier League today as West Ham play host to West Brom at Upton Park. The Hammers are eighth and, while the Baggies are 13th, the visitors can move to within a point of their hosts with a win as they aim to claim a second London scalp in as many weeks having beaten Arsenal last time out. West Ham have lost twice as they have failed to win in their last three league outings and will be aiming to put that right. 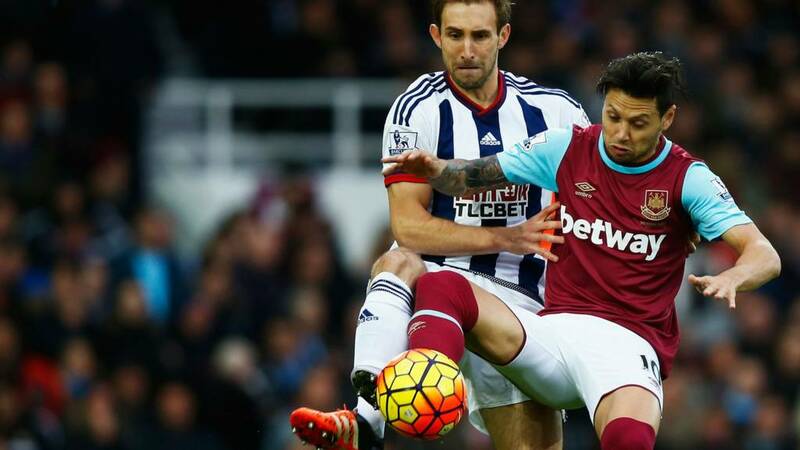 Welcome to our live page for West Ham v West Brom. We'll have text commentary here from 13:30 GMT. You can keep up to date with all the action from today's other Premier League games including Tottenham v Chelsea, Norwich City v Arsenal and Liverpool v Swansea City.